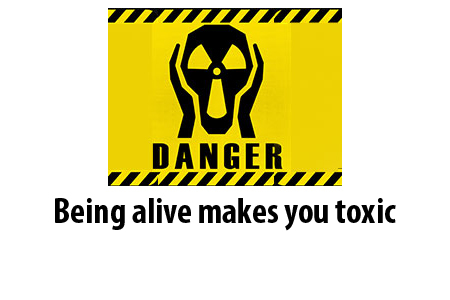 Blog The reason you are toxic is...you! Now, what if I told you that the greatest source of toxicity isn’t the aforementioned externalities (which are definitely at play), but rather your own physiology? If you try to hold your breath for a few minutes, you realize that the buildup of CO2 from cellular metabolism is the prime source of toxicity. If you have liver insufficiency, ammonia builds up and causes cognitive dysfunction, as well as clotting disorders from inadequate synthesis of clotting factors and jaundice from inadequate clearing of the hemoglobin breakdown products. If you have kidney failure, you can’t process the nitrogen breakdown of protein metabolism. Even with good kidneys, a form of toxicity can occur from eating lean meat without fat or carbs known as “rabbit starvation”. If you have a hit to your pancreas or are obese, then you have excessive blood sugar which can cause direct damage to the eyes, kidneys, and blood vessels. Finally, if you have a scarcity mentality and are constantly living in the past and future, you create toxic thoughts which degrade your appreciation for living, productivity, and relationships. I close with an intersting conversation I had with a 79 yo retired physician a couple of months ago. He had been taking TA-65, a telomerase activator for years now. I was shocked that in contrast to the previous conversations we have had over the years, his voice was strong, clear, and logical. He wasn’t even aware of it, but in the past, he seemed sleepy, confused, and his speech was faltering. The explanation came when he told me that his liver cirrhosis resulting in bulging neck veins from a clogged up, scarred liver, had gone away! Clearly, his brain fog had cleared because his ammonium levels were more normal. Now we can’t say that this had anything to do with the TA-65, but it is unusual in a man of his age to spontaneously improve. For more information about hepatitis, please watch this video. To get a clearer understanding of how things like “rabbit starvation”, diabetes, jaundice, neurosis, and breathing work, read my user-friendly quick start guide to being human, The Telomere Miracle: Scientific Secrets to Fight Disease, Feel Great, and Turn Back the Clock on Aging.